But Can We Eat It Elsewhere? Christmas Bird Counts Coming Soon! Whether by chance or by design, this week witnessed the publication of two studies on birds from the islands made famous by Charles Darwin. 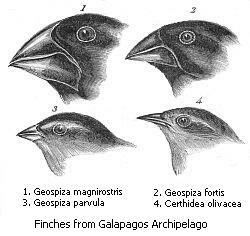 The first concerns one of the best-known examples of evolution, the Galápagos finches. A married pair of biologists have been banding and tracking finches on Daphne Major for several decades. In 1981, they banded a medium ground-finch (Geospiza fortis) that was significantly larger than most other medium ground-finches on the island. Since then, its descendants, which have unusual beaks and songs, have stopped breeding with other medium ground-finches. The fact that 5110's descendants haven't mixed could be because they differ from the natives. The Grants note that the descendants have a differently shaped beak from those native to Daphne Major. As finch beaks are vital in identifying potential mates, this could serve to keep them reproductively isolated. 5110's offspring also have the avian equivalent of a strange accent. These finches learn their songs from their father, and the Grants suggest that 5110 sang the songs from his birth home of Santa Cruz then modified his come-hither ballad by roughly copying the Daphne Major birds'. This imperfect copying, they suggest, has over time acted as a barrier to interbreeding. Lukas Keller of the Zoological Museum at the University of Zurich, Switzerland, agrees that 5110's case is special. However, he thinks it may be possible to generalize to other species who learn behaviours such as singing in a similar way. "For me it's a very exciting paper," he says. Whereas Darwin thought that a new species would take a considerable amount of time to appear, Keller says that this paper "shows how rapidly reproductive isolation can develop". It is not yet clear that this is a new species, even though some headlines give that impression. However, it does provide a real-time view of how reproductive isolation and speciation can begin. The second study reports on the feasibility of introducing a rare mockingbird into part of its former range. Darwin and his colleagues had collected specimens of the Floreana mockingbird (Mimus trifasciatus) from Floreana Island, part of the Galápagos archipelago. Due to human interference, the mockingbird became extinct on Floreana but survived on nearby islands. The Charles Darwin Foundation wants to bring the Floreana mockingbird back to Floreana. Before attempting to do so, they compared DNA samples from the remaining subpopulations to that of specimens collected by Darwin. This revealed that the two sub-populations split from each other very recently. This split, the researchers said, was likely caused by the Floreana mockingbird becoming extinct. Its extinction would have severed a "bridge" between the two populations - meaning that it was no longer possible for them to interbreed. Even though they have evolved independently and become inbred, this study showed that the tiny sub-populations have retained much of the important "genetic variation" once found in the mockingbirds on Floreana. This is good news for the survival of the species. It has led the researchers to conclude that future conservation plans should focus on protecting "the two satellite populations in situ and establishing a single third population on Floreana". This reintroduction could use birds from both islands, the researchers said, "to maximize genetic diversity". I suppose one remaining question is whether the mockingbirds from these subpopulations will be inclined to interbreed after being separated for so long. That issue is not addressed in the BBC article, but the scientists seem confident enough that it may not actually be a problem. Aside being fascinating examples of biodiversity in action, these two studies highlight the continued usefulness of bird research techniques that may seem dated. The mockingbird study showed the importance of museum collections as repositories of physical evidence for future generations of ornithologists. In this case, it provided DNA evidence for a study of subpopulations, a use that probably was not imagined by Darwin and his companions when they collected the specimens. The study of ground finches relied on bird banding to identify and track individual birds.